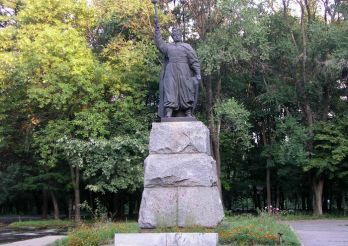 Monument Builders embankment in Dnipropetrovsk is located in the central part of the city, in the street Lenin Embankment near the park Shevchenko. It is a gift from grateful residents of a group of scientists and builders, who put his hand in the creation of this architectural masterpiece Dnepropetrovsk. A special role in the creation of the waterfront played two scientists - Milman Boris and Vladimir Zuev. Boris Yakovlevich was then the manager of the trust "Dneprospetsstroy", and Vladimir was one of the most famous architects of the time in Dnepropetrovsk. Among his most famous works we can mention the project of restoration of the hotel "Ukraine", a diorama of "Battle for the Dnepr", which was represented by a new exhibition of the Historical Museum named Yavornytsky and many others. 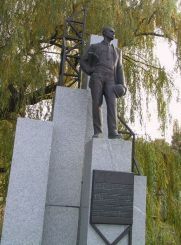 The monument has appeared on the embankment in August 1996. The composition consists of five pedestals, one of them is the figure of a man, in his hands he holds at Kask. This figure Boris Milman. The other two presented architectural forms. 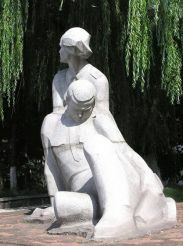 This project was made by sculptor V. Nakonechny and architect Vladimir Miroshnichenko Two plaques on the pedestals remind anyone in whose honor this monument was erected. 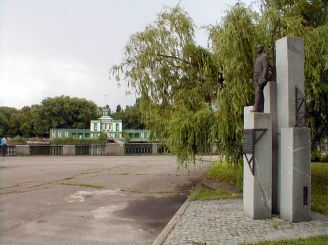 Quay in Dnepropetrovsk is one of the main attractions of the city. Panorama of the modern metropolis it is very difficult to imagine without the composition of the waterfront, it seems like it was always there, but this is not the case. For a long time in the place of the modern promenade has a warehouse and lumber mills, for a long time, city residents have been deprived of the exit to the Dnieper. Only in 1950 was the decision to build the embankment. During the construction period the waterfront was also the question of the reconstruction of a modern sewer system of the city. Then B. Milman and Zuev offered along the banks of the Dnieper to build a single collector for sewage, water and gas, and to protect the coast from the destructive action of groundwater was suggested the most original decision - to build a dam of metallurgichekih waste. To construct it by alluvium sand and slag bedding. In the sixties, it was extended in the direction of residential areas and Victory Red Rock. In our time, the length of the waterfront is 30 km away. To get to the waterfront monument builders can be by public transport, which moves along the street Lenin Quay. Stop - "Shevchenko Park." Near the monument there are such iconic attractions Dnepropetrovsk, as the sculptural composition "Tree lovers", "balls» and Shevchenko Park.